I offer one-on-one QuickBooks Accounting Training. While one-on-one instructor-led training is more expensive than attending a group class, it is a good investment when you have a specific issue to solve or you need to get started in the right direction with your accounting/bookkeeping needs. I can help you figure out the best solutions for your particular accounting issues, and give you a strategy for how best to pursue your short-term and long-term goals for your business. Getting off on an ill-advised path in accounting can be very costly in the long run; getting the right professional advice from the start will certainly be well worth the investment. For over twenty five years, I held various accounting positions starting from Staff Accountant to Accounting Manager to Controller to CFO level, all in San Diego working for small to big companies. Now, you can take advantage of my extensive accounting/finance expertise for less. 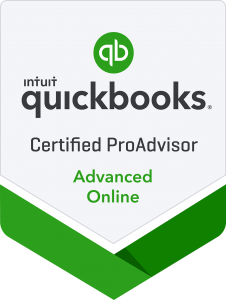 I am also an Advanced Certified QuickBooks Online ProAdvisor. Please call me at 858-768-9281 if you are having trouble with QuickBooks accounting, or, would simply like to get started now.